The following list of surnames and clans is based on the 2000 A.D. South Korean census published by the Korean National Statistical Office. Typically, each clan will have its own family history and genealogical record (JokBo, 족보). 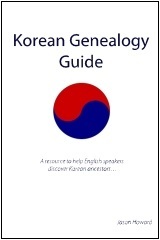 You can search for an online genealogy for a Korean family clan at http://gok.kr . Thanks for you listing. Not sure if my wife’s grandmother’s clan 溫陽方 is the same as the 溫陽房 clan as listed, since the last character is a little different.